Welcome to my Student Led Conference! The first piece I have chosen is an email I have sent to HKNWB (Hong Kong Non Woven Bags). I chose this piece because I think it shows that Ellen and I have been committed to our exhibition! Even though the exhibition has finished we are still doing a lot of work. We have already ordered our bags and we will be getting our bags delivered in about a week to 9 days! I am really excited! to say a bit. In the end Clio and my radio show was about 5 minutes long but Leilanie helped us with the sound effects. Leilanie was on her own so she didn't have enough people to record. In the end we just joined together, and then we joined our radio shows as part 1 and 2. Leilanie's radio show was a lot like ours so it wasn't very hard to edit. In the end with Leilanie's and Clio, and my radio shows, we had a radio show about 10 minutes long. Another piece I chose was my zhou ji book. 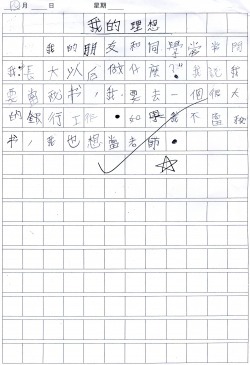 In our Zhou ji book we have to write a paragraph every week. I chose my best paragraph which I think is the one I wrote about the job I want to be when I am older. I only had a little help from my Mandarin Tutor on words I didn't know. I think that when i am older I want to be an accountant, because it would be sort of cool being able to have so much responsibility on you and you can take all the phone calls. I like being known as someone to trust because it makes me feel proud to be (in my case) a nice friend. 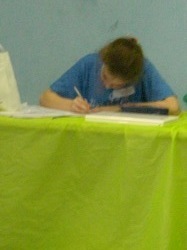 I also chose Mandarin because I have just moved up to the top group half way through the school year! I think I have improved in my Mandarin through out the year and I am really am happy for myself! I chose this piece for math because I found it quite fun and I think that my favorite type of math is graphs! I honestly do not like fractions anymore because we spent about half a year on them and they are just really annoying now! I find graph really cool and fun! 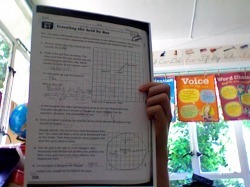 Right now for our Math I am really happy because we are finishing off the year with graphs! I also really understand how to do them and I actually find them quite easy! Thanks for listening to my Student Led Conference! I hope you learned quite a bit about me as a learner, and a kid. It's an alien, we can see a flag that has a picture of Neptune on it! Clio: Dr. Gee, Dr. Gee, what happened? Erin: You must leave now. Clio: Do you hear those sounds? Those are meteorites that the aliens are firing! Take Cover! We must leave and get to safety. Look there are some people fighting back with these unexplainable guns. Please wait a moment while I send my brave assistant out to into the meteorites to ask them who they are and what they are doing. Erin: They are the anti alien force! They will help us bring the aliens back to Neptune, dead or alive! Clio: Thank you very much Dr. Rib. Our plan is to get the aliens and bring them back to their little planet Neptune, hopefully these people have enough materials to help us with that. We must discuss together how to capture these barbarians! Erin: We must leave here and get back to the office. Clio: I agree we will be back here tomorrow and hopefully the anti-alien team will have already captured a few aliens. Clio: They have captured them all! They are hanging in a net and they have stolen the Neptunian’ ray guns, and space ship. The Anti-alien force has saved America! Now we can get them to N.A.S.A., and bring them back to Neptune. Astronaut: We would like to invite you into Space with us so you can find out all the sizes and looks of the planets. Clio: That would be great! We would love to see the planets up close and see the aliens leave to Neptune. Astronaut #2: We are in Space. Erin: Look at this chart! It shows you all of the planets of the solar system sizes! Clio: Wow look at Earth, we just left home! Clio: Now we are passing Mars. This planet is the closest planet to Earth, and on the chart it says that it is 6,800 kilometers in diameter. Clio: Did you know Mars is smaller than Earth and is full of red and rock, and it is like a giant grand canyon! Clio: Did you know that Jupiter is the biggest planet in the Solar System? Well it is! In diameter it is 143,000 kilometers! That is about 130,200 kilometers in diameter bigger than Earth! Erin: ,and I thought Earth was big. Clio: Now we are scraping the ground of Saturn. Saturn is known for it’s beautiful rings. Besides Uranus, and Neptune, it is the only planet with rings. However, it is the biggest planet with the beautiful rings. Erin: Saturn is 125,000 kilometers in diameter. Not as big as Jupiter, but still HUGE! Clio: Wow I thought it was only an hour! Astronaut #2: You never really know how long you have been gone, unless you have a special time tracking machine that we have. Astronaut: Nothing we are just landing. Clio: We better get the Neptunian’ out and let them be home at last! Clio: Do you hear that? That is the sound of the aliens walking home. Next is Part 2 with Leilanie's script. We would finally like to order our bags. After looking at the sample we have decided to change a few things about it such as size. We would like our bag to be about 3 inches bigger in length and width. What size would you suppose that would be, and how much would it cost? Also we would like to have the bags as one side the Hong Kong Academy design and the other the Turtle design. Can we make these changes? If so, may you please send us the Quotation of how much it would cost to make these changes. On Friday I had biathlon training, and we had to go to South Bay. Biathlons are when you swim and then run. We had to swim around the shark net which is 200m and then we got out of the water got our shoes on and ran a 2 kilometer run. We kept on doing the swim because it was quite hard for some people who don't do swim training (like my brother), and the run was quite easy. We did the whole way around the shark net about 5 times and the run once. We did the biathlon training because next Sunday I will be racing in a biathlon. I have only done two so far and in the first one I won my race and in the second one I got second place. I hope I do well in the next one as well. I think that 1 thing my group did well in was presenting our action because we were able to explain the process of making and designing the bags. I think that was the reason people ordered because they thought that we knew our stuff and we were really passionate about the turtles and they thought that we really wanted to help. I think that we should have been more strict, because some kids ordered bags and didn't pay yet but they said they would later, and now that I think about it, they probably won't and we do not want to give away free bags to people who won't bother paying. I think that as an individual I think that I did well with the little kids and older kids. I think that it is important to be able to present to different ages. For the little kids I read them a book with easy words so they could understand our problem. For the older kids we had a lot of posters with harder words, and keynotes. I think that I did better presenting to the little kids than the older, because with the younger all you had to do was read them a book and they would be satisfied. When the eighth graders came they asked us to walk them through our presentation, but we didn't exactly have a 'script'. We got through it though by getting them to read our brochure, and keynote, and answering all of there action questions and other questions. I think that one thing my group could have done better in was advertising for the bags! Andy said that we should have had a big sign saying you can buy bags for 40 dollars. I agree with him because some people didn't know we were selling bags until we told them. Even with our poster process of designing bags they didn't realize we were selling them. If I ever did the exhibition again I would be much more firm with how they pay. If it was an adult I would be okay with it because usually you can trust adults, but if it was a student next time I would clearly tell them that they have will not get their bag until we receive all the money. I think it is much more important to let people know that you can't just sign up for things and never pay for what you bought. I think it would be much better if I just said, you don't get your bag until you pay. Next time I did a big project and is selling something I will make sure I do that. So far today my group has done a lot! We have 24 bags ordered already. Shane said that we have to be careful because some people might want one but won't pay the money for one. We told him not to worry because over the weekend Ellen will send all the kids who ordered an email and ask them if they are allowed and if they will pay and when. So far we have 960 dollars. That is 500 dollars off of what we have to pay back the school. After that we only have to raise another $700. 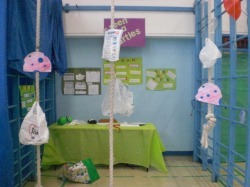 Even if we don't get all the money to pay back the school and adopt a green sea turtle, we will at least have stopped people buying plastic bags! 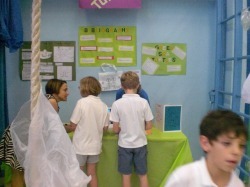 Today in exhibition I spent most of my time making a story book for little kids. In the morning we had a gallery walk and people would fill out a sheet that says what did they do well in, and what do they need to improve in. People really liked Ellen and my stand but some thought that the writing was too small, we couldn't fix that, but some people said that we needed more pictures on our posters, so then Ellen started fixing our posters and I looked at the rest of the comments. Most of the others said the same things but the last one said that we should have something for the little kids. That is why I worked on the book. I got really far into it and I finished the writing part and I finished coloring the pictures and all I have to do is now make the text more readable, then I am done! I thought that I worked really hard and I managed my time really wisely and now all I have left is just doing the bibliography poster that will only take a few minutes. I think that my group will do quite at the exhibition and I hope you will think so as well. I wasn't able to mark my rubric because Ellen saved it somewhere I had no access to, so I will tell you what I am doing anyway. So for communicating I think that I would mark myself as 5 because I sometimes I am not communicating to the best of my ability so I think that 5 is right where I am at. 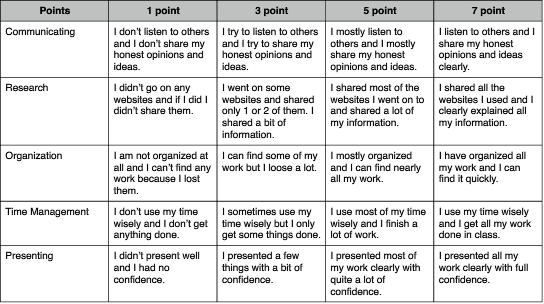 For research I would give myself a 5 because sometimes I forget to tell all my information, but I still tell a lot. For Organization I would definetly give myself a 7 because I have a folder and I can get to all of my work really quickly. For Time Management I would give myself a 5 because I have been using my time really well but sometimes I don't get all of my work finished in class. I can't do anything for presenting because we haven't done the presentation yet but I hope I will do fine. That is where I think I am on the rubric! So far in my exhibition group we have researched, worked on wiki, started making an experiment, made keynotes for exhibition and Mrs. Virginia, sent a bunch of emails back and forth with companies, conservations, and the school, we also started ordering bags and we are going to order a sample on May 4th and will get it on May 6th! I think we are quite good so far! 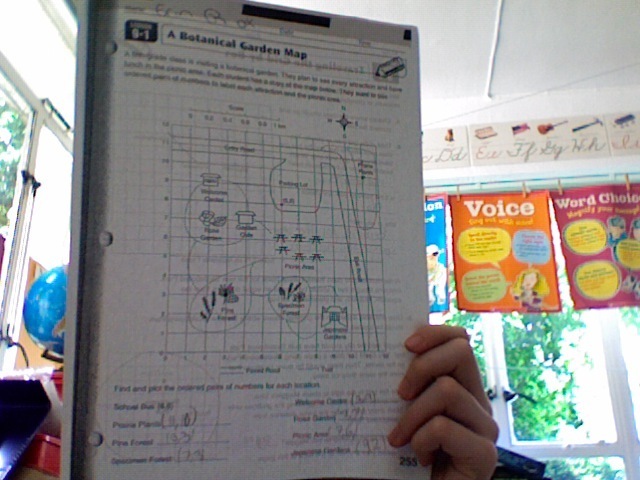 We still have to make our poster order all the bags and finish our experiment. We don't have a lot to finish. I don't really have any concerns about are group but convincing the school to help us. I hope that they will help us because otherwise we won't have any action, but then if they do help us we will have two types of action! In the exhibition the part I am really proud of is the design I made for the bag because I made it really simple and then I put it on the computer and I was really proud of my work. I think that next week at the exhibition I really want people to learn how bad plastic is for the turtles and I want them to stop using plastic bags. Today at exhibition my group was sending emails forward and back to Mrs. Virginia trying to schedule a meeting with her to discuss our action. Finally we scheduled a meeting on Thursday at 10:00 A.M. After we scheduled the meeting Ellen and I wrote a keynote for the presentation. We had another one but that was more for the exhibition night. During the keynote Ellen and I had a disagreement because I was telling her what to write but then I wanted to type the words, so Ellen let me and then she said that we shouldn't both be working on it so I volunteered to but she wanted to do it instead but I raised the point that I was giving her all the ideas and she was just typing so that would be why I should get to do it. So then she just went walking around the room until we edited it. Then we started to become responsible and worked together again but at that time there wasn't a lot of time left because of the Grade 2 exhibition. I think next time we should work together better. At least we both learnt a lesson, and now we won't do it again.